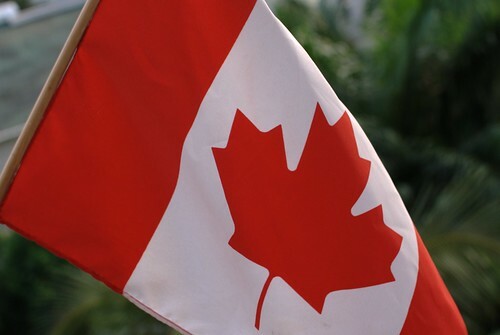 A happy Canada Day and Fête du Canada to all those whom this greeting may concern! As I've said before here, my father loves your country, he says it's the most breathtakingly beautiful place on Earth with some of the friendliest people… he did say "warm people" at one point, but given the double entendre regarding climate he changed his wording! I'm determined to visit it myself one day :-). As for the photo, when my dad came back from Toronto after his last business trip he brought me back a huge flag. Taking a photo of something so lightweight and that's constantly moving in the breeze was harder than I thought it would be! The white balance is way off given it was taken in the early evening, but I really love the colours as-is. We Aussies desperately need a new flag as beautiful as the Canadian one. Canada proves you can be a Commonwealth realm (aka: having the Queen) without needing a boring Red or Blue British Ensign as the basis of your national flag. Peace, democracy and love… keep showing us the way Canada!